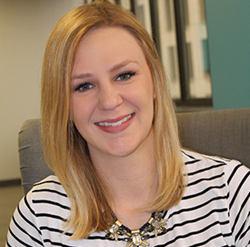 Search Influence promotes Partner Accounts Team Manager Alison Zeringue to Director of Account Management. In order to do the best possible job for each client, Search Influence trains every team member to gain skills and advance their career in the industry. "I look forward to developing a cohesive team of experts who are passionate about making a difference for their clients and Search Influence." Search Influence has promoted a team manager to the job of Director of Account Management. By promoting from within, Search Influence demonstrates a commitment to further developing the skills of its dedicated team members and leaders. Alison Zeringue has worked at Search Influence for over five years, most recently as Partner Accounts Team Manager. An alumna of Archbishop Chapelle High School in Metairie and LSU, Zeringue has a large extended family and roots in the New Orleans area. Throughout her career, she has worked directly with multi-location businesses and partner companies, making the services of Search Influence more impactful for businesses across the country. "Aside from seeing the impact that SEO, online advertising and social media can have on a small business, I love that I will have a hand in the personal and professional growth of our employees," said Zeringue. "I look forward to developing a cohesive team of experts who are passionate about making a difference for their clients and Search Influence." With a reputation established over ten years of service, Search Influence has proven that it can flexibly meet the digital marketing needs of a wide range of business clients. Account Managers are critical for keeping open channels of communication with clients and making sure that the Internet Marketing and SEO services are tailored to the unique demands of each industry. "In her new role, Alison is responsible for ensuring that Search Influence has a satisfied client base who are clearly seeing the effects of our marketing efforts in their businesses daily," said Co-Founder and COO Angie Scott, "The best way to achieve that end is to ensure our internal team is engaged in their work of providing top of the line customer service and online marketing products to our customers." To learn more about jobs at Search Influence, please visit http://www.searchinfluence.com. To speak with someone in the office, call (504) 208-3900. The company is located at 935 Gravier St. #1300, New Orleans, La. 70112. A national online marketing company based in New Orleans, Search Influence specializes in optimizing potential. Whether working directly with customers or with publisher partners, Search Influence focuses on customer return on investment. Search Influence offers local SEO, social media marketing and a full range of online marketing services, including in-house production services.